Greyhound racing returned to the Central Coast tonight following a $762,000 upgrade of Gosford greyhound racetrack funded by the NSW Liberals & Nationals Government. Racing was halted at the Gosford Showgrounds circuit in early 2018 after large blue metal stones began coming to the surface of the loam track presenting serious concerns of injury for any greyhound racing on the track. It followed on from an extended three month break in racing in 2017 when the track required remedial works following heavy rain. Mr Mestrov thanked the NSW Government for its investment into upgrading regional greyhound racetracks after he pledged in 2017 to do whatever was required to address the ongoing NSW track issues which saw many meetings abandoned or deferred; especially those on GBOTA managed greyhound tracks. The rebuild of Gosford however wasn’t without its issues. The track was shutdown in February 2018, but it it took five long months to secure the funding to pay for the works required while the track sat stagnant; with neither the GBOTA, nor GRNSW, willing to spend their own hard-earned on the track. The lack of urgency to commit to a plan to facilitate a return to racing not only left local participants disadvantaged, but had many wondering if the track would be permanently closed. Once building began it was originally thought the track would be ready for racing in September, but further delays saw that start date pushed back another two months. Gosford is the first track upgrade under the NSW Government’s $30 million, five-year program to make racetracks across NSW safer for racing dogs, with additional upgrades to be announced in the future. The meeting was hampered by some heavy rain which may have impacted the way the track raced. Five races were held over the new 388m distance and another five over the revamped 515m journey. The new 603m and 710m distances were not given a run. 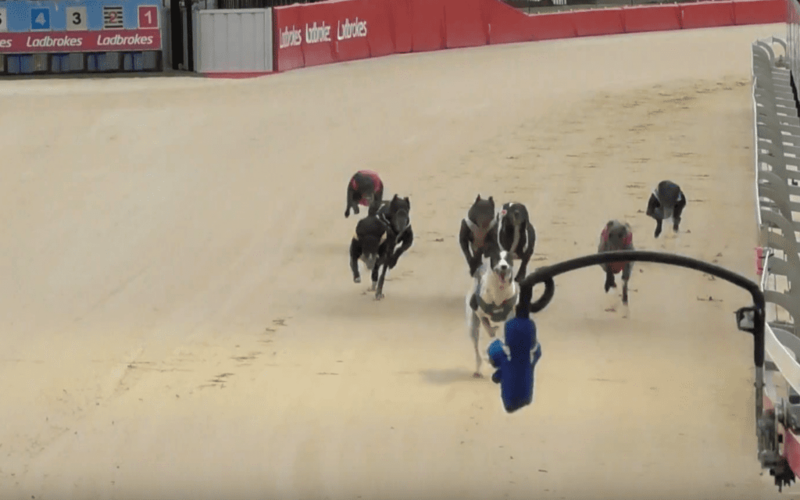 Given most greyhounds had probably not had an opportunity to trial on the new track, racing was relatively clean, with less interference than the old track layout. The track has been extensively cambered according to new track recommendations and this did seem to demonstrate less interference in running, with greyhounds generally holding their line well. Greyhounds that got wide on corners and back straights did seem to race unhindered out there although not many made ground from those positions. Part of the rebuild included moving the starting position of the boxes and those changes seem to have had mixed results. The 388m start is a definite improvement, but the new 515m start position appears to have had a negative outcome on early interference. In both cases though, first corner interference had been reduced. The 388m start position did appear to provide a better run early in comparison to the inevitable interference that used to occur from the 400m boxes. Most dogs appeared to be able to negotiate an almost straight run to the point of the corner which was in stark contrast to the old starting position. From the 515m start though, the boxes have been moved much wider on the track and this seemed to cause quite a bit of interference as greyhounds were left with no option but to move left to get closer to natural running positions and the rail. The trouble seems to sort itself out before the first corner though, which is racing much cleaner than was evident from the old start. Leaders were naturally favoured and greyhounds who railed appeared to have an advantage on those racing wider. Consequently run on greyhounds seemed to be better positioned if they made their runs down on the rail than trying to come around greyhounds. It is only early days and the track will need to settle in further for any conclusive impression to be formed, but as seems to be the trend nationwide; the track is now best suited to early pace greyhounds who rail. The overall impression is that the new track recommendations are generally positive and track layout interference has been reduced, especially at the first corners. Slight modification of the the 515m start may be needed when there are more results to be drawn from. *Pandemonium unofficially is the fastest greyhound under race conditions to race over the 388m running 10.10, 22.22 in a performance trial against just two other greyhounds.